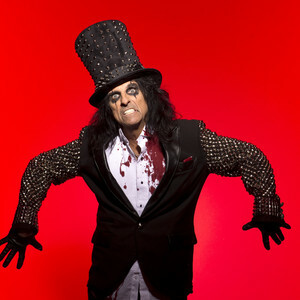 All Alice Cooper items listed below are authentic and very limited. We do not carry multiple items. All prices and availability are subject to change. All prices include shipping and handling for all USA customers. All other destinations will require actual shipping cost to complete transaction. Have a question? Ask us before purchasing the item. Thank You. Description: 7x9 Alice Cooper full color Australian 2005 concert handbill. 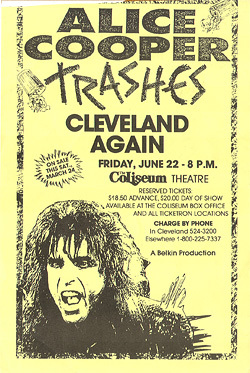 Description: 5x7 Alice Cooper two color 1988 concert handbill. 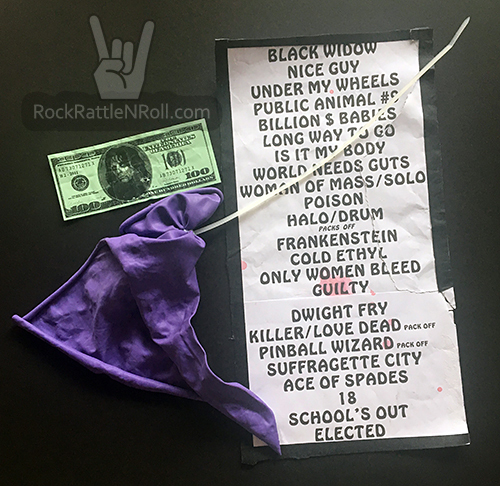 Description: Alice Cooper 2016 Concert Setlist, Cooper Money and Purple Balloon all used at the August 24th, 2016 concert at Verizon Theatre in Grand Praire, TX. The setlist was placed in the center stage used for Alice Cooper. It has some fake blood stains. Note: The setlist is torn apprx. 8.5" x 17", the Cooper money has a hole and the balloon was popped and unusable. Description: 26 Original Alice Cooper photos taken on his 1978 From The Inside Tour at the Spectrum in Philadelphia, Pennsylvania. Complete 4x6 photo set $49.99 Total Cost. Shipping Included. Description: Full Unused Ticket in VG+ condition. Size 1.5x4.